class="page-template page-template-page-sections page-template-page-sections-php page page-id-874 samba_theme wpb-js-composer js-comp-ver-4.1 vc_responsive"
Based in Bournemouth, supplying and fitting carpets and flooring to industrial, commercial and home environments for over 40 years, we’d like to think we know a thing or two about the business. From our spacious showroom in Boscombe, we have one of the largest range of carpets and vinyl in the Bournemouth area. 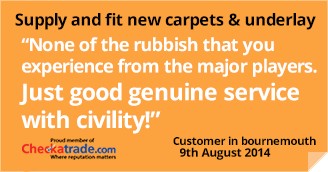 We’re recommended on Checkatrade.com with a 100% satisfaction rating – all our reviews are genuine and from customers who know that we’re probably Bournemouth’s best carpet and flooring supplier. Our free estimates for carpets and vinyl are very competitive and you are under no obligation to buy, although we doubt you’ll find better quality carpet at such reasonable prices in Bournemouth. Your carpet will be expertly fitted, and we’ll even take your old carpet away (charges apply). We also look after Nursing Homes, Schools and Offices in Poole, Bournemouth, Christchurch surrounding areas in the Dorset area. Why not call one of our friendly carpet specialists today? QCF Bournemouth – carpets and flooring from people you can trust, for over 40 years!